With over 20 years of experience and know-how behind the unique anatomical shape of OPRO’s self-fit mouthguards, OPRO Platinum is the ultimate self-fit elite level mouthguard. Its durable outer layer and uniquely designed concussion pads afford optimum impact protection, combining with a flexible inner layer for supreme comfort and fit. The unique design of the inner channel features OPRO’s patented ‘fins’ – slim rib-like structures – that are made from a special gel-like material that softens and becomes more fluid when placed in hot water. This allows the mouthguard to fit snugly around the teeth to form a perfect, highly retentive fit that follows the position and contours of the teeth. With the addition of OPRO’s patented fitting cradle, the fitting process is not only incredibly simple, but provides precision like no other, the maintenance of minimum thickness between top and bottom teeth critical to impact absorption and protection. Extra features include the presence of an odour and taste free antimicrobial additive, that has been proven to provide near complete protection (99.99%) from bacteria. Once moulded, the Platinum mouthguard provides excellent protection for teeth and gums from injury during any ball, stick or combat sport, with no shortage on comfort and ultimate protection. OPRO Platinum comes in 3 different styles and is available from http://www.opromouthguards.com (RRP £24.99). 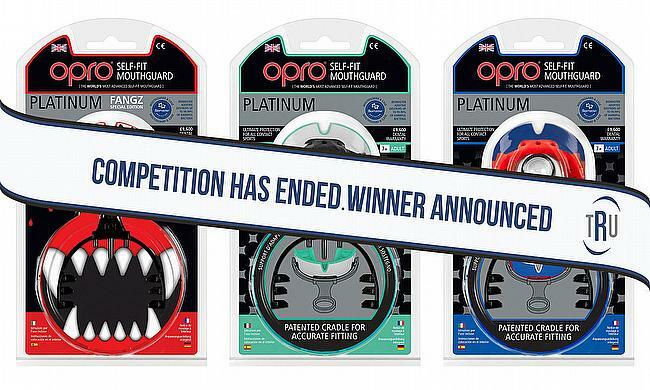 To enter and be in with a chance of winning your OPRO Platinum Mouthguard please enter below.